When you're cooking that Thanksgiving turkey this weekend, it might be tempting to pour the extra grease down the drain. But there are some gargantuan-sized reasons to avoid that temptation. From London to Baltimore, horror stories about fatbergs — giant globs of fat and grease mixed with disposable wipes and other debris — have made headlines in recent months. Fatbergs have wreaked havoc on the sewer system, clogging pipes and forcing a costly removal. The one in London was 130 tons, the size of 11 double decker buses. 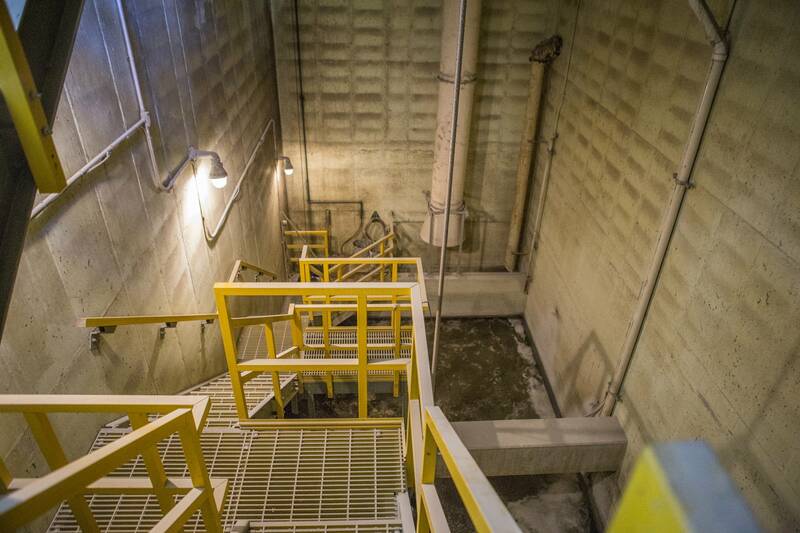 Minnesota hasn't had any monster fatbergs — yet. But the sticky combo of grease and wipes is still causing plenty of problems for city sewer systems around the state. 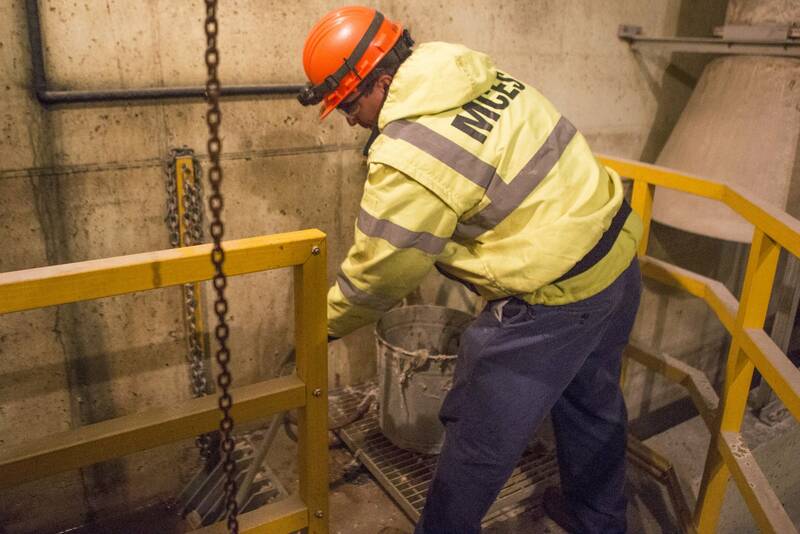 At a sewer lift station in Eagan, Randall Mateo, an interceptor service worker for the Metropolitan Council, has the unenviable job of raking disgusting clumps of unidentifiable material from a metal grate and dumping them into a garbage can. He describes the mess: "Some rags and wipes, and anything that's big enough to get stuck in the screen here. And there's some pieces of grease." This is all the stuff that people pour in their drains or flush down their toilets that they shouldn't. It ends up here, where it can clog up city sewer pipes and jam equipment if it's not removed. Conditions for fatbergs get the worst around holidays like Thanksgiving and Christmas, said Cathy Rofshus, public information officer with the Minnesota Pollution Control Agency. "We're all enjoying this big turkey dinners, and then people have those roasting pans with the drippings in the bottom," she said. "For decades, we've just washed that down the sink with lots of hot water and sudsy soap." Once the fat and grease reach the sewer, it congeals and coats the inside of the pipe, said Cynthia Finley, director of regulatory affairs for the National Association of Clean Water Agencies. "It's just like a person who eats too many fatty foods and it clogs up their arteries and blood vessels with the fat," Finley said. "The same thing happens in sewer pipes." The problem got a lot worse about a decade ago, when the popularity of disposable wipes exploded. They're marketed for everything from cleaning to removing makeup to bathroom hygiene. Many of these products are labeled flushable. But that's misleading, Finely said. They don't break down in water like toilet paper, so they get stuck in pipes or in sewer equipment. "Every time you flush a wipe or flush dental floss or feminine hygiene products or pour fats, oils and greases down the drain, it's not going to disappear," Finley said. When wipes combine with fats and grease, they can form concrete-like masses. Removing them is difficult and expensive. Doug Kammerer, utility superintendent in Watertown, Minn., said grease has stopped up sewer pipes in his city, forcing workers to use high-pressure hoses to scour the insides and remove the blockages. "How we tell it's grease is when you pull the hose out, it's very slick, very slimy," Kammerer said. "You know then it's grease that's causing the backup right there." Restaurants also contribute to the problem, but not as much as people may think. Many cities require them to install a trap that catches most of their grease before it reaches the sewer pipes. That's where Art Kallenbach saw an opportunity. Kallenbach owns a company called Drain King. He empties those traps and takes the grease to a wastewater treatment plant in St. Paul. But Kallenbach says grease traps have to be maintained and emptied regularly to work correctly. "Some of these stores will put in a grease trap and then forget about it and never pump it," he said. "I've been to stores five years old and they didn't even know they had a grease trap." Most people don't have grease traps at home. Rofshus advises pouring that grease into a container, then put it in the trash. Wipe out those greasy pots and pans with a paper towel before you wash them, and don't flush anything but toilet paper. "What we're trying to tell people is even if it says flushable," Rofshus said, "put it in the trash."